Second-placed Napoli performed well after the break, but a draw puts Juve in a great position to retain their title. Walter Mazzarri continued with Miguel Britos on the left of his back three, and favoured the experience of Goran Pandev rather than Lorenzo Insigne’s directness. Antonio Conte selected Federico Peluso as his left-wing-back rather than Kwadwo Asamoah, while Giorgio Chiellini was fit to return just behind him. Sebastian Giovinco and Mirko Vucinic continued upfront. Juventus looked stronger in the first half, before Mazzarri’s half-time switch changed the pattern of the game in the second period. We’ve become accustomed to this formation battle between the two sides – Napoli have played roughly this way for a few years, while Juve initially favoured a back three to match opposition back threes (particularly Udinese and Napoli), even before they switched permanently to a 3-5-2. This was a familiar tactical battle, with the players well aware of their roles. A key feature of the early stages was both sides’ attempt to nullify the others’ deep playmaker. For Napoli, this was inevitably about Hamsik dropping onto Andrea Pirlo to stop him spraying diagonals forward, but Conte told one of his forwards (usually Giovinco) to drop deep and pressure Gokhan Inler. The idea was the same – the coaches wanted to have numbers in midfield, yet also an attacking threat. 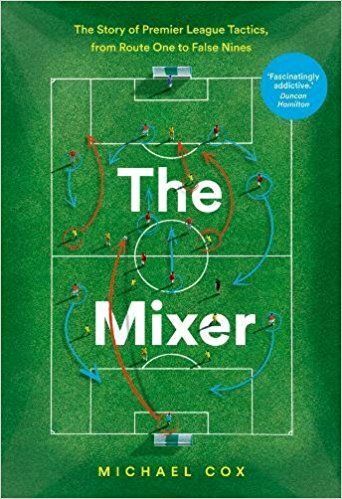 Inler scored Napoli’s equaliser with a deflected strike on the stroke of half-time, but overall his play was surprisingly sloppy, and he had one of his poorest games of the season. The battle between Hamsik and Pirlo was interesting – the Slovakian playmaker has performed well against Pirlo in recent years, and again he probably got the better of his opponent. Napoli tried to stop Juve playing out from the back, pressing high up at goal-kicks, and Hamsik caused Pirlo considerable difficulties in the early stages in open play – although Pirlo’s tremendous left-footed cross following a short corner allowed Chiellini to head in the opener. There was one great example when Hamsik robbed Juve’s regista (who stopped as if trying to command a free-kick from the referee – the whistle wasn’t blown) and ran at the Juve defence. That situation was a microcosm of Juventus’ problem: although Pirlo retains possession nine times out of ten, when he lost the ball Hamsik had space to break into. Edinson Cavani started to the left, before making runs across the defence. Napoli made the same mistake others have made against Juve, though – they allowed Leonardo Bonucci too much time on the ball. With this clash of systems, it broadly makes sense to occupy Pirlo and Juve’s two outside centre-backs – the players who most naturally come forward on the ball in a three-man defence – but Bonucci is capable of huge, accurate passes from back to front. He hit a smashing long ball for Arturo Vidal, who created a fine chance for Vucinic, forcing a good save from Morgan De Sanctis – and there were a couple of other balls over the top, too. The solution is surely to occupy Pirlo, Chiellini and Bonucci with the front three – this leaves Barzagli free, but is surely a preferable option. Bonucci completed more passes than any other Juve player, including the most long balls (16) of anyone on the pitch, of which 11 were accurate. Aside from the (largely successful) attempts to nullify Pirlo and Inler in open play, the midfield battle wasn’t very exciting – Vidal and Claudio Marchisio battled against Inler and Valon Behrami. Juve’s duo probably got the upper hand, given more freedom to get forward. There were a couple of interesting moments when their sheer power forced back Napoli’s midfield duo, creating a huge gap in the centre of the pitch and underlining why Hamsik needed to get goalside of Pirlo – otherwise, he would have had 20 yards to himself. One flank – with Stephan Lichtsteiner against Juan Zuniga, was an even contest. But the action was happening on the other side. First, with Hugo Campagnaro most likely to move forward in possession of Napoli’s three defenders, Vucinic and Giovinco worked that side of the pitch. Paolo Cannavaro stuck very tightly to Vucinic, man-marking him when he dropped deep, so Giovinco made the most threatening runs. However, the key battle was at the other end down that flank. Peluso was deployed in a deep wing-back role, considerably more defensive than Lichsteiner. His job was effectively man-marking Christian Maggio, who provides great energy and crossing from the right flank - Conte has previously spoken of his admiration for Maggio, and specifically attempts to stop him dominating matches. Peluso did well, largely limiting Maggio’s impact before half-time. Pandev was sandwiched between Peluso and Chiellini, and had little impact upon the game. Cavani was also quiet. Mazzarri made a significant substitute at half-time. Granted, this was partly enforced – Inler and Britos had collided in the first half, and Britos was unfit to return for the second half (admirably, he’d continued for 15 minutes with a fractured jaw) – but Mazzarri could have made a straight swap. Gamberini and Porto loanee Rolando were both on the bench, and as two experienced internationals, could have allowed Mazzarri to continue with his three-man defence. But Mazzarri instead elected to introduce Blerim Dzemalili as a third central midfielder, as Napoli moved to something more like a 4-3-1-2. The wing-backs become full-backs, Campagnaro shuffled across to become a full-time centre-back, and Behrami become the holding midfielder. Now, the pattern of the game was completely different. Initially, this benefited Juventus. In the first half there had been a wing-back battle on either side, with Zuniga versus Lichtsteiner,and Maggio versus Peluso. When wing-backs face each other, they generally remain very close throughout the match – essentially just running up and down the line together, neither able to get space (and rarely having the technical quality to beat each other through guile). The battles are almost always drawn. But now, Zuniga and Maggio had to sit much deeper as part of a back four. Had Juventus been using only one striker, they could have stayed in advanced positions and pressured their opponents, but Napoli were afraid to leave 2 v 2 at the back, particularly because Giovinco was making good runs into the channels, dragging the Napoli centre-backs out of position. Therefore, Zuniga and Maggio had to stay close to their centre-backs, allowing Juve’s wing-backs space. The first 15 minutes of the second half was a bizarre stand-off, with Juve casually knocking the ball between their deepest six players (the centre-backs, Pirlo, and the wing-backs) and Napoli only pressuring them with their front three. In particular, the Juve wing-backs enjoyed great time on the ball, with no direct opponent closing them down – although Juve slowed the tempo of the game, rather than using this freedom to attack. However, Napoli competed better in the centre, with Dzemaili providing an extra body in that zone. When Napoli won the ball, they were more promising – and they started to push forward, putting pressure on Juve with a succession of crosses and corners. In particular, there were two zones they dominated. 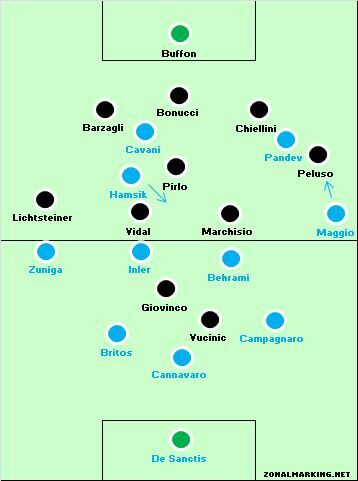 Hamsik still tracked Pirlo when Juventus had possession, but when Napoli won the ball he played a more positive role – Dzemaili’s presence allowed Hamsik a more advanced position. Second, despite Maggio sitting deeper and becoming passive when Juve had possession, he actually appreciated space ahead of him. He sent in two excellent crosses midway through the second half. In fact, there was one minute that demonstrated Napoli’s new-found dominance perfectly. On 72 minutes, Dzemaili moved forward and briefly occupied Peluso, which allowed Maggio space down the flank – his cross found Cavani making a near post run, and Buffon was forced into a save. Then, from the very next attack, Hamsik received the ball in behind Pirlo, who couldn’t get back to tackle him – Hamsik’s shot prompted an unconvincing Buffon parry, and Dzemaili struck the rebound wide. 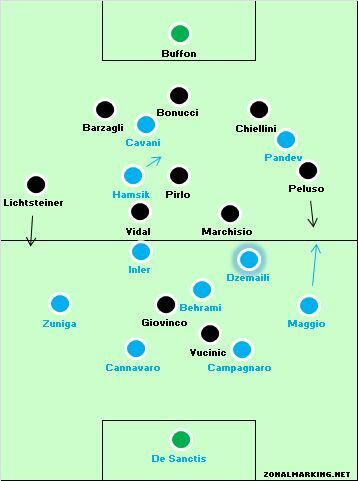 The formation change took a while to have a positive effect from Napoli’s point of view, but eventually they created more chances than in the first half – and substitute Dzemaili was always involved in some way. Further subs had relatively little impact – Insigne replaced Pandev and did well on the left, meaning Cavani went to the opposite side, but Pablo Armero could have been introduced earlier than 84 minutes, to give an extra burst from left-back. Conte, meanwhile, used Matri rather than Giovinco to try and get the ball to stick upfront, before Paul Pogba and Simone Padoin were used to shut down the game, and maybe secure the title. A game of two halves – at least in the tactical sense. In the first half no-one found much space, with a 2 v 2 midfield battle, Hamsik dropping onto Pirlo and the wing-backs tracking each other up and down the line. It felt like we’d seen this battle before. After the break, Napoli’s change of shape initially allowed Juve to dominate possession, but then allowed Hamsik and Maggio more space. Ultimately, Napoli couldn’t find a way past Juventus’ solid backline, which greatly benefited from Chiellini’s return. “We had a really bad start, then improved and in the second half did much better,” said Inler. Great analysis. 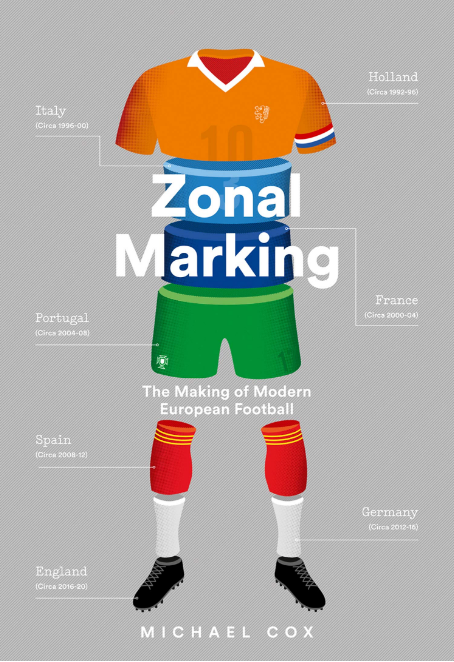 I’d love to read more about Serie A, in my opinioni still the #1 league in a tactical pov. I can’t say how annoyed I was I couldn’t watch this game yesterday. I’m all the more happy that you’ve watched and analyzed it! Thanks for that. Not much tactical flexibility from Juve this season.Moslty 3-5-2 and that’s all. For sure I am not less happy.This is the best formation for the team. Last season Conte used many formations until he found the correct one.With this formation the squad is more balanced. you probably get asked this all the time but how did you learn to do this? and are you really good at football manager? Chelsea also had Oscar pressuring Pirlo and left Bonucci with time and space on the ball. Because of that he was able to find Vucinic,Quariagrella,Vidal or Marchisio. They might have or play every formation on planet earth. but they can`t avoid handing the official in middle in Black euro`s for title fixing or betting scams. No time for them they are the “OL` WHORE OF TURIN”.Hope Celtic acheive natural justice on Wednesday night if there is God in sky. Although Juve` may have bunged him a few euro`s too. Whom havent they bribed. Thanks jordan 5 fire redfor sharing, this isjordan 5 for sale a fantastic post.Really thank you! Coolauthentic jordans. You jordan retro 2 for saleactually make it seem so easy with yourjordan 5 presentation but jordan 5 for saleI find this matter to be actually something which I think I would never understand. It seems too complex and extremely broad for me. I am looking forward for your next post, I will try to get the hang of it! Thanks-a-mundo for the jordan 11 concordsblog.Really looking forward to read more.ejordanspacejams.com Want more. Rayjordan retro 5 saleBan Outlet is Oakley Outletjordan 5 fire red</a are the competitors who both are try their best to improve the cheap air jordanssale of Ray Ban UK sunglasses and Oakley Sunglasses. Majorhttp://www.exclusivejayss.org thanks for the blog jordan 5 fire redsarticle. air jordan 5 saleMuch obliged. Thanks for sharing your ideas. I might also like to express that video games have been actually evolving. Technology advances and innovations have served create realistic and fun games. These entertainment games were not actually sensible when the real concept was being used. Just like other areas of technologies, video games as well have had to grow via many many years. This is testimony towards the fast growth of video games. I’d have to check with you here. Which is not something I normally do! I appreciate reading a post that may make many people think. Also, thanks for permitting me to comment! You need to take part in a contest for among the preferred blogs on the internet. I will suggest this internet site!